Tired of seeing your vegetable scraps and more heading into the garbage? 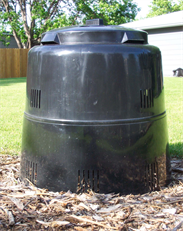 Compost them with an Earth Machine™ backyard composter! Homeowners can use the Earth Machine™ to compost leaves and grass from their yards, as well as fruit and vegetable scraps, crushed egg shells, tea bags, coffee grounds and filters, and more to create rich humus for lawns and gardens. This soil amendment can be used in place of chemical fertilizers, topsoil and mulch. The Earth Machine™ is very user-friendly, controls moisture, heat and ventilation, can be secured to the ground, and turns kitchen and yard waste into a rich soil in as little as six to eight weeks. It stands about three feet tall and is about two feet wide with an 80-gallon capacity. The Earth Machine™ can be purchased for $50.00 by calling 701.241.1449. Note, the Solid Waste Department is unable to make change; please bring a check or exact cash when you pick up your composter.